It’s good to look to the Netherlands for inspiration on how to embed cycling into our everyday lives but it’s also worthwhile pointing out that decent cycle infrastructure has been created in the UK, and by British road engineers. There’s Stevenage, of course, the Dutch-style cycleway-network-that-time-forgot, but there are other examples, too, such as Livingston in Scotland. Both Stevenage and Livingston were – are – veined with bike paths. However, as driving was as quick as cycling in these two towns, and certainly as convenient, locals chose to drive everywhere rather than cycle. For cycle infrastructure to be well-used in the UK it will probably have to be built in places where cycle use is already high. No point throwing seeds on stony ground. Cycle use in Oxford is far higher than the UK average (it’s normally stated as about 14 percent modal share for cycling but, as this map using data from the 2011 census shows, some areas of Oxford are seeing levels of 20-30 percent modal share by bicycle). In 1966, and despite having a car factory in the town, 46 percent of Oxford households had no car. While post-war planners in Oxford were as car-fixated as elsewhere in the UK they also – sometimes – included cycling in their road plans. One such road was the Marston Ferry Road. This was opened on 12th November 1971. It has an adjacent separated bike path, so wide it’s actually a third lane, more of a road than a path. A separate footpath was provided for pedestrians. By Marston Ferry with its punt and chain. His populist travel guides of English counties encouraged motorists to explore away from honey-pot towns and cities and out into the countryside. Produced by an off-shoot of the Dutch oil company, Shell, the Shell Guides were aimed at motorists. The first two in the series were written by Betjeman and published in 1934 and 1936. The Shell Guides went on to become a major series of guidebooks, popular for many years, and responsible for many car journeys into the “unspoiled” countryside, including the countryside around Oxford. 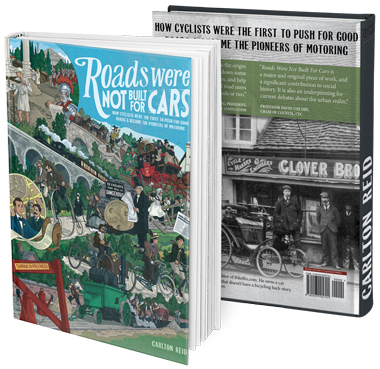 With more and more Brits taking to the roads in an increasing number of private motorcars – forcing cyclists off the rural roads they had thought of as their own since the 1870s – planners and politicians provided more for cars than bikes, including in Oxford, although ‘King Car’ didn’t always get its own way. A plan to build an urban motorway into the centre of Oxford, obliterating the peace of the Christ Church Meadow, and hatched by Dr. Thomas Sharp in Oxford Replanned of 1948, was shelved in 1966 by the Ministry of Transport after opposition mounted during a public inquiry held in 1965. Turner’s article – ‘Has Oxford a future? A town menaced by the car’ – didn’t mention cycling as part of the solution to the town’s transport woes but it’s interesting that the Marston Ferry road was opened in the same year. Map by Cyclox, the Oxford cycle campaign. The cycle path adjacent to this arterial road is a good one (so good it was the subject of this recent blog posting) but, of course, it doesn’t form part of a tight-grid of similar paths. Oxford has a curate’s egg cycle path network: good in parts. Despite the width of the Marston Ferry road cycle path, it ends all too soon and the cyclist is thrown back into the maelstrom of fast-moving motor vehicles. Nevertheless, Cherwell School – which is sited next to the cycleway – sees a great deal of cycle traffic in the mornings and afternoons. In fact, more than 60 percent of pupils cycle to and from school. And, for safety, the cycleway has recently been divided in two by a painted dotted line. 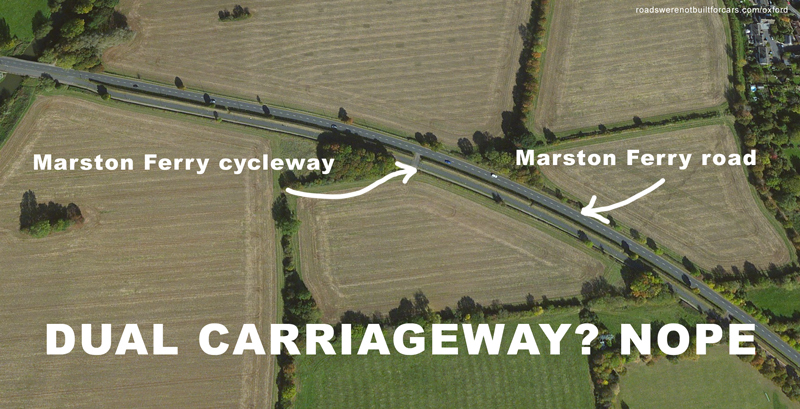 The Marston Ferry cycleway is an example of how British engineers have built arterial roads with adjacent high-quality cycle paths. The problem isn’t one of skills, it’s getting the cash and maintaining the political will to build a whole load of new cycleways. Do even Britons call Britons ‘Brits’ now? Ugh! When I left Blighty no one except the Irish used that awful word. I can confirm that this cycleway was in place in January 1978 when I moved to Oxford and started commuting by bike from Marston to North Oxford, which I did until 1990. The surface was not brilliant but it was resurfaced in the late 1980s and bollards installed to prevent occasional use by cars looking for parking close to the river. There was always a separate path for pedestrians separated by a narrow verge but the pedestrians tended to stray onto the cycle track, especially if pushing prams or buggies. As I recall, some sections of the Oxford Ring Road also had cycleways running alongside the carriageway and I think one ran alongside the A40 out towards Wheatley but these were much neglected. Which suggests it was built at same time as the road rather than as 1980s addition (a period when some cities got a wee bit of bike infra). Oxford has big cycle tracks next to the northern and eastern bypass as well. The eastern bypass track used to see lots of cycle traffic – people commuting to the car works. Marston Ferry Road is perhaps distinctive in that it is inside the urban area, so has a high number of users, particularly to the secondary school at the west end. The school was a secondary modern, and quite “prefab” and run down. When grammar schools were abolished, it benefited from a dynamic head who decided to encourage cycling – promoting a kind of us-against-the-world culture. As a result, quiet routes were developed (by the City Council) to the north, south, north-west and south-west, mostly on residential roads, but with some links across private land. This included Pelican crossings of main roads (this was before Toucans had been invented). Maybe the track on Marston Ferry Road triggered this, but it was the decades of lesser improvements to other routes, and cultural promotion that has led to such a high level of cycling. The other secondary schools in Oxford, with varying qualities of cycle network, have probably 10%-20% cycling from within a ~3km radius. Re those workers on their bikes riding to the car factories – there’s a quote from William Morris who said the market for cars would be truly immense once workers drove to work. In the 1950s this was almost unthinkable. Despite having this tremendous cycle path, there are some cyclists who still insist on riding along the road… I have no idea why? Are they fantatics? As a motorcyclist and driver who uses this road every day, I have seen this fairly frequently. I would implore cyclists to use the path. It creates an entirely unnecessary road hazard, and is even worse when I’m on my bike if you don’t. Maybe these are fast “roadie” cyclists? Department for Transport advice has it that cyclists who can ride fast (at 15mph and above) should generally ride on the road, not on cycle paths. Of course, it’s up to the individual rider. Those that ride on the road here may wish to get along as quickly as possible, without mixing with those slower than themselves. So, same as you.